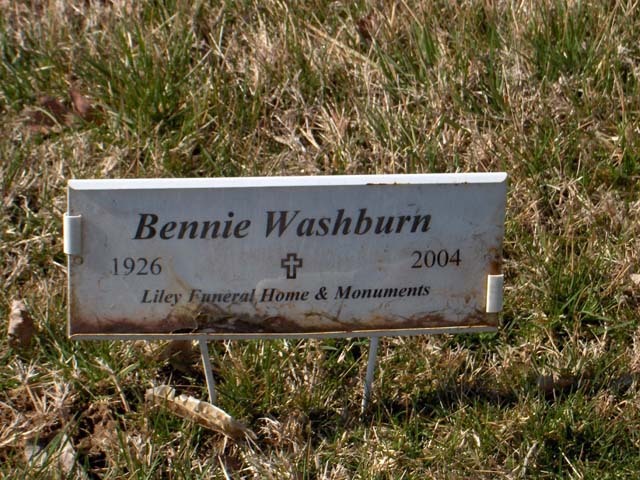 Bennie Washburn, 77, of St. Louis, formerly of Marble Hill, died Monday, Feb. 16, 2004, at his home. He was born Nov. 17, 1926, in Blackwell, Okla., son of Walter and Jennie Hancock Washburn. He and Thelma Fulbright were married Sept. 26, 1954. She died April 29, 1996. Washburn had been a barge builder with St. Louis Ship Builders. Survivors include four sons, Walter and Cecil Washburn Jr. of St. Louis, Denver Washburn of Hillsboro, Mo., Donald Washburn of Pevely, Mo. ; two daughters, Glenda Williams of St. Louis, Donna Washburn of Bonne Terre, Mo. ; a sister, Snook of Oklahoma; seven grandchildren; and two great-grandchildren. Friends may call at Liley Funeral Home in Marble Hill from 9 a.m. to service time Thursday. The funeral will be at 1 p.m. Thursday at the funeral home, with the Rev. Jimmie Fulbright officiating. A committal service will be held at Bollinger County Memorial Park Cemetery Pavilion.